Home Tags Posts tagged with "us embassy in cuba"
Fifteen Cuban diplomats have been expelled from the US after Havana failed to protect US diplomats from mysterious acoustic attacks. The State Department’s move follows last week’s US withdrawal of more than half of its own diplomats from the Cuban capital. Nearly two dozen US personnel have suffered ill health after unexplained attacks in Havana. At least 21 people working at the US’s embassy in Havana have reported health problems, ranging from mild brain trauma and deafness to dizziness and nausea. Earlier reports suggested sonic attacks were to blame, but nothing has been proven. Havana denies targeting embassy staff, and the US has not blamed the Cuban government for the suspected attacks. More than half of the people working for the US embassy in Cuba have been withdrawn in response to mysterious attacks which left its diplomats unwell. Washington is also warning Americans not to visit Cuba because some attacks occurred in hotels. At least 21 embassy staff reported health problems ranging from mild brain trauma and deafness to dizziness and nausea. Describing the US decision as “hasty”, Cuba said it would affect bilateral ties but co-operation would continue. Secretary of State Rex Tillerson said the two countries would continue to co-operate in investigating the attacks and said diplomatic ties would be maintained. Earlier reports suggested that sonic attacks were to blame, but Cuba denies any involvement. At least two Canadians were also affected. The US is ordering all non-essential staff in the embassy in Havana to leave, along with all family members. Only “emergency personnel” will remain. The US has suspended visa processing in Cuba indefinitely. “At least 21 employees have been targeted in specific attacks,” the official said. Despite an investigation involving the FBI, the Royal Canadian Mounted Police and the Cuban authorities, there is still no full explanation as to the cause of the incidents since late 2016. Earlier reports suggested there were sonic attacks in which staff in Havana were targeted by audio waves, leaving several with chronic hearing issues. Using an inaudible sound device for a stealth attack “is quite plausible from a technical point of view”, Denis Bedat, a specialist in bio-electromagnetics, told AFP this week. He gave as an example the Active Denial System (ADS), an anti-riot gun used by US police forces that emits electromagnetic waves which produce a sudden unbearable burning sensation. The US has not blamed Cuba for the suspected attacks. According to the state department official, both the US and Cuban governments “have not yet identified the guilty party”. “We have not ruled out the possibility of a third country as a part of the investigation but that investigation continues,” he added. Cuban President Raul Castro had reportedly given his personal assurance to the then-US charge d’affaires in Havana that Cuba was not behind the attacks. The US reopened its embassy in Havana in 2015 following decades of frozen relations. According to US officials, a suspected acoustic attack on US embassy staff in Cuba was reported as recently as last month. It was originally thought that the incidents had ended several months ago. The State Department also said the number of staff who have reported health problems had increased to 19. It comes as the union representing diplomatic staff says some victims suffered mild brain injuries and permanent hearing loss. Cuba has denied any involvement in the attacks and says it is investigating the reports. US embassy staff and at least one Canadian began to notice symptoms late last year. 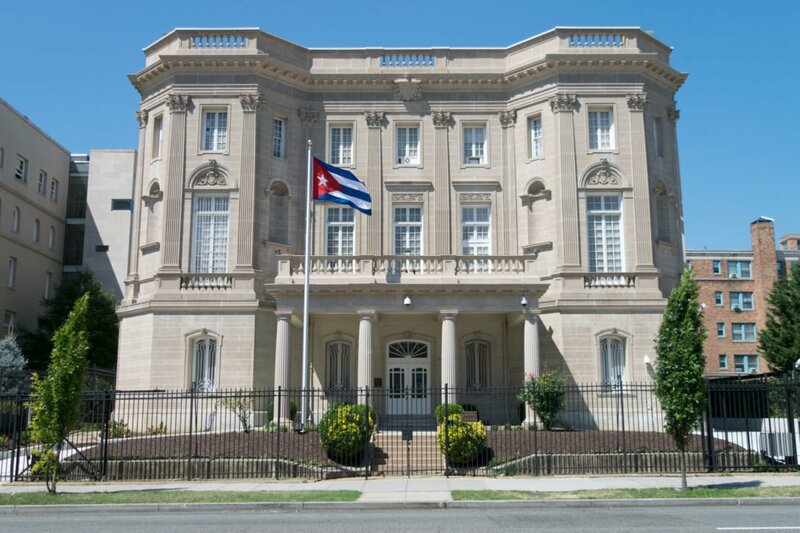 However, the affair was first reported in August when the US expelled two Cuban diplomats from Washington. US officials said the expulsions were in protest at Cuba’s failure to protect its diplomats. Sonic devices may have been used to emit inaudible sound waves that can cause deafness. On September 1, the US government confirmed that an incident took place as recently as August and that the number of staff reporting problems had increased. In a statement, the American Foreign Service Association, which represents US diplomatic and international aid staff, said it had spoken to 10 people who had received treatment. “Diagnoses include mild traumatic brain injury and permanent hearing loss, with such additional symptoms as loss of balance, severe headaches, cognitive disruption and brain swelling,” the statement said. The American Foreign Service Association urged the government to do everything possible to help those affected and to “ensure that these incidents cease and are not repeated”. The statement is the first time that the hearing loss has been described as permanent. It is understood that “mild traumatic brain injury” could include concussion or headaches. The State Department is yet to blame anyone for the incidents. The US mission in Cuba was reopened as a full embassy in 2015 following 50 years of hostilities between the two countries. At least one of Canada’s diplomats stationed in Cuba was treated for hearing loss and headaches, the country’s foreign ministry says. The announcement comes a day after the US said its diplomats in Havana were experiencing strange physical symptoms. Reports suggest the diplomats could have been targeted by a covert sonic device that causes hearing loss. Cuba denies the allegation, but the US has removed two Cuban diplomats from Washington DC in retaliation. Global Affairs Canada, the country’s foreign ministry, says the government is working with US and Cuban officials to find out what happened. The Associated Press reported that a US investigation determined that the US diplomats’ hearing loss could have been linked to sonic devices which emit inaudible sound waves that can cause deafness. US officials, speaking to the agency anonymously, said investigations had determined devices had been deployed either inside or outside diplomats’ homes. Investigators are also considering the possibility that a third country, such as Russia, was behind the incidents, officials familiar with the inquiry told AP. According to US officials, about five diplomats, including some spouses, had been affected, but no children were involved. State Department spokeswoman Heather Nauer said staff began complaining of the strange symptoms late last year. While they were not life-threatening, she revealed that a number of people had been brought home to the US as a result. The US and Cuba only re-established ties in 2015, following 50 years of hostilities between the two countries. Florida Senator Marco Rubio said the alleged incidents were just the latest examples of harassment toward US diplomats in Cuba. “Personal harm to US officials shows the extent the Castro regime will go and clearly violates international norms,” the senator said. If true, the use of sonic devices to cause harm to diplomats would be unprecedented. 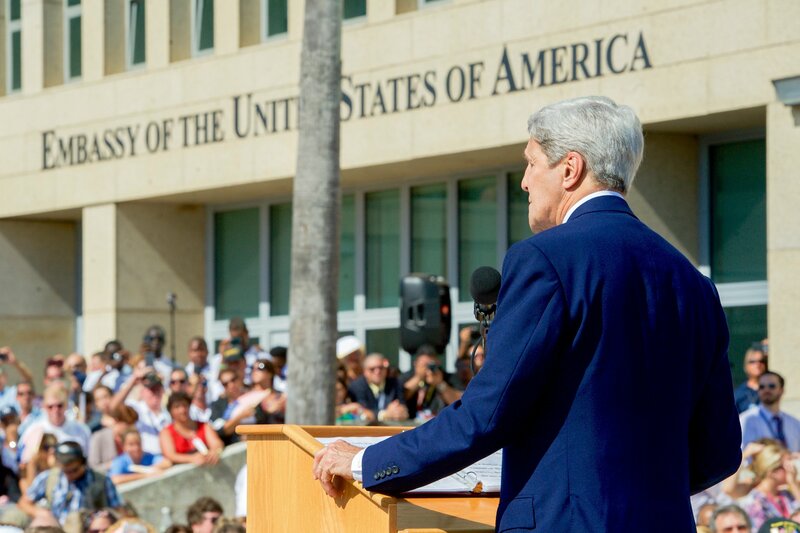 Cuba and the US have opened full embassies in Havana and Washington. Just after midnight local time, the diplomatic missions of each country became full embassies. The two countries formally restored diplomatic relations after an agreement struck in December 2014 putting aside decades of hostility came into force. Secretary of State John Kerry is due to hold talks with his Cuban counterpart Bruno Rodriguez later in the day in Washington. Despite the historic shift, Cuba and the US admit to lingering difficulties. There were still “issues that we don’t see eye to eye on”, a US state department spokesman said. Restrictions on Americans wanting to travel to Cuba remain in place, as does the wider US trade embargo banning most American companies from doing business in Cuba. Cuban President Raul Castro has urged President Barack Obama to lift it, calling it the main stumbling block towards normalizations. But the US Congress would have to vote on the issue. Barack Obama and Raul Castro announced the move towards diplomatic ties in December 2014. The United States and Cuba are to announce the opening of embassies in each other’s capitals, a senior US official has said. 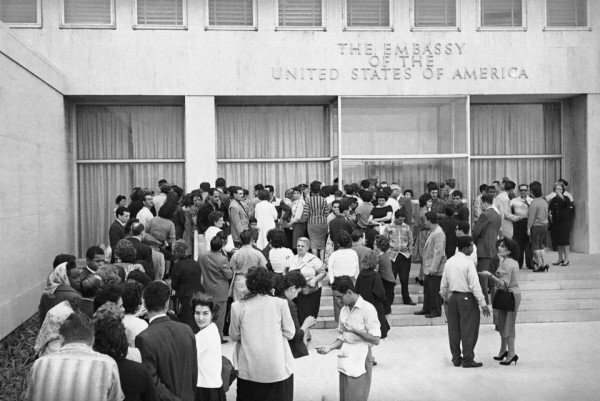 The embassies opening is a major step in re-establishing diplomatic ties between the US and Cuba which were severed in 1961. Relations had been frozen since the early 1960s when the US broke links and imposed a trade embargo with Cuba. The US and Cuba agreed to normalize relations at the end of 2014. 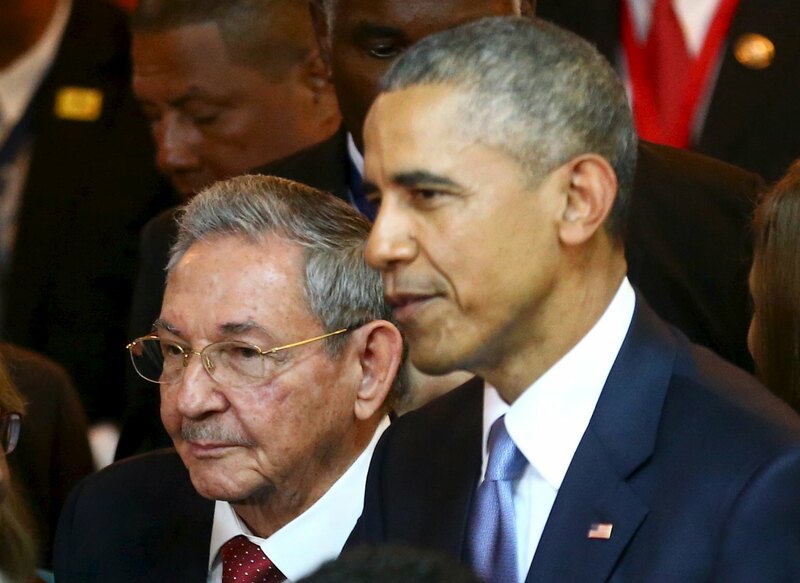 Presidents Barack Obama and Raul Castro held historic talks in April 2015. Since 1977, the US and Cuba have operated diplomatic missions called “interests sections” in each other’s capitals under the legal protection of Switzerland. However, they do not enjoy the same status as full embassies. US officials said President Barack Obama would make a formal announcement from the White House on July 1. It is still not clear exactly what the date will be for opening the embassies, but it is likely to be in mid-July. The US State Department must give Congress two weeks’ warning before the embassy can open. In April, Barack Obama and Raul Castro met for the first formal talks between the two countries’ leaders in more than half a century. A month later, the US removed Cuba from its list of state sponsors of terrorism. 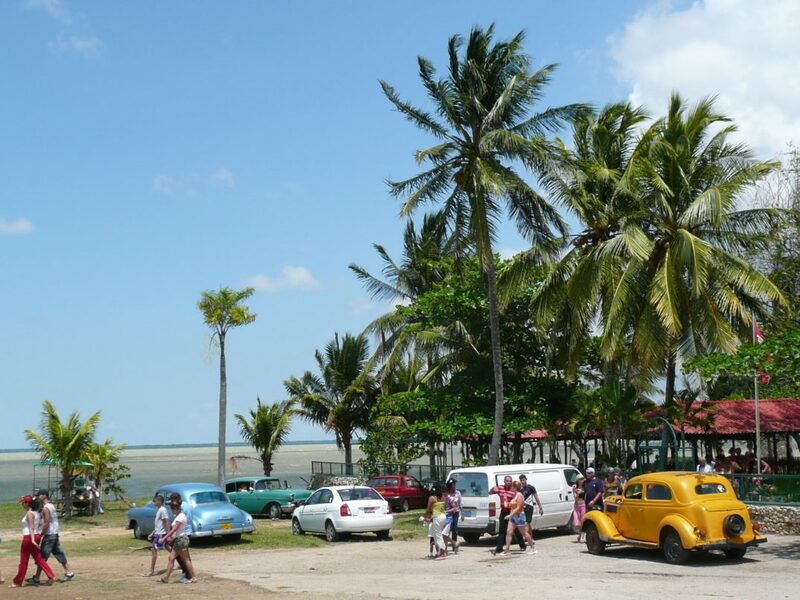 Plans to resume ferry and air services between the US and Cuba were also announced. Despite the new transport links, a Cuba travel ban is still in place for US citizens. Cuba is also still subject to a US arms embargo which has been in place since 1962, though President Barack Obama has urged Congress to lift it. The US broke off diplomatic relations with Cuba in 1959 after Fidel Castro and his brother Raul led a revolution toppling US-backed President Fulgencio Batista. The Castro brothers established a revolutionary socialist state with close ties to the Soviet Union. In December 2014, Barack Obama and Raul Castro made a surprise announcement saying they would seek to re-establish diplomatic ties, ending more than 50 years of ill-will.